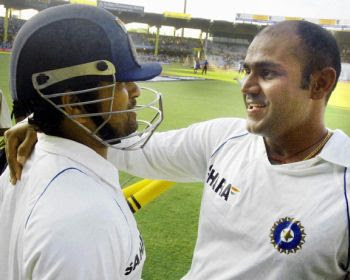 Virender Sehwag, who set the tone for India's victory in the first Test against England rated Little master Tendulkar unbeaten century as the best of the hundreds that the master batsman has scored so far.This is Sachin's best hundred I had seen. Here at the Chennai in 1999, he was injured against Pakistan in a similar situation. He could not finish off the match for India at that time. But this time he won the match for us, Sehwag added. I was surprised the way Tendulkar and Yuvraj batted with ease as the pitch was a difficult one to bat on with the ball turning and bouncing. I was telling yesterday that if we play 80-90 overs we will win. It happened today with Sachin Tendulkar and Yuvraj Singh batting really well," Sehwag said after India won the match. The dressing atmosphere is fantastic.I have been playing cricket for eight years and I think the atmosphere is really great.